Let’s face it – as well as we try to treat our bodies, and as healthily as we nourish ourselves on a daily basis, sometimes we just need a healthy dose of fatty, nostalgic comfort food. Such was the case a few days ago, when I had a craving for my mom’s scalloped potatoes. ALL DAY I thought of the creamy, bubbly goodness of those potatoes. Well, mom wasn’t around, but luckily, I had enough ingredients so that I could make a dish of them for dinner without having to run out to the store – for me, nothing kills a craving faster than having to actually go out and get stuff (it’s not that I’m being lazy…exactly). So I made these potatoes and served them with a side of salad; that was dinner for Bane and I. He loved them! My picky-eater child ate all of his first helping and requested another; when he got full he asked me to make sure that I saved the rest for him to eat for lunch the next day. I call that a success. Melt the ¼ cup butter in a saucepan over medium heat. 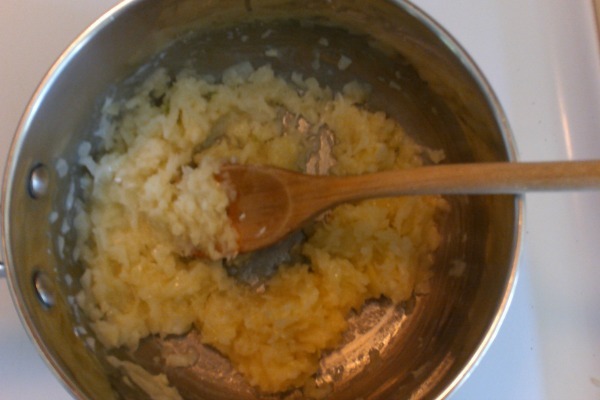 When it’s melted, add the onions and cook until soft. Then add the garlic. Sprinkle with flour and add your milk. 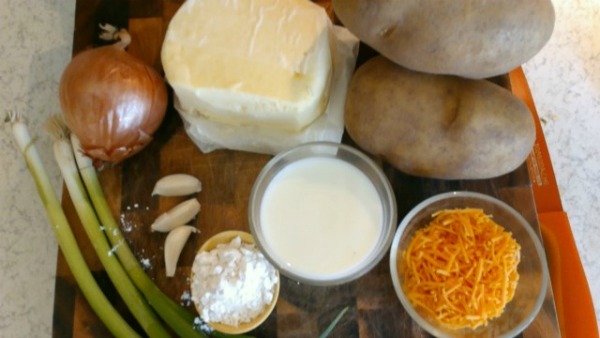 Stir it all together, then add the sour cream. Stir, and turn the heat up to medium-high. Continue stirring the mixture until it gets bubbly. It should be getting thicker at this point. Remove from heat and stir in ¾ cup of the cheddar and ¾ cup of the Parmesan. 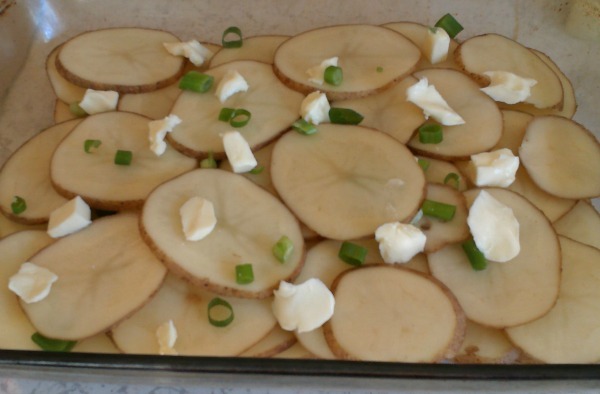 Let it sit and thicken while you slice and assemble the potatoes. 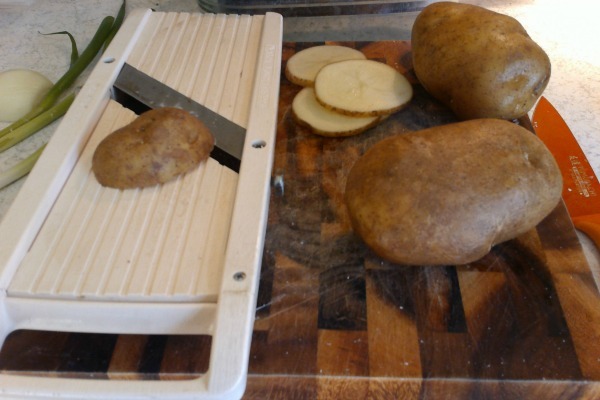 I used a mandolin slicer to make slicing the potatoes a million times faster and easier. 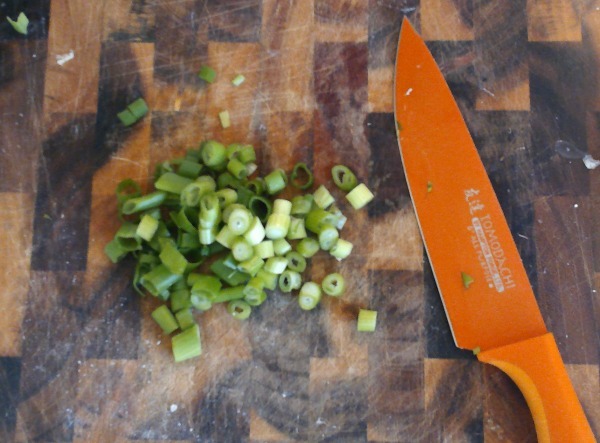 This is the best way to get thin, uniform slices – but just use a knife if you don’t have a mandolin. Spray a glass casserole dish with cooking spray and lay down the first layer of potatoes. If you want, add a couple of small squares of butter before adding the second layer. Continue until the dish is ¾ of the way full of sliced potatoes. Pour the sauce over the potatoes, slowly, making sure to get it all over. 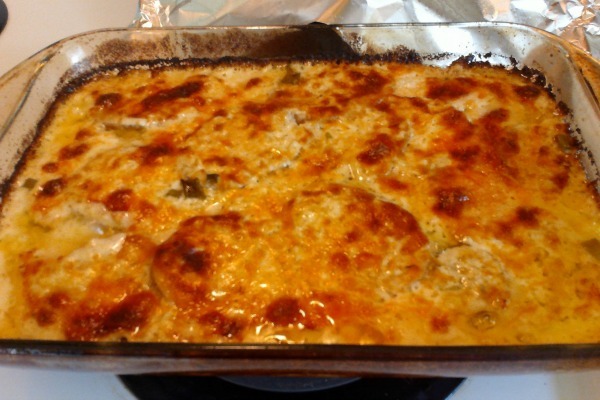 Mix the remaining cheddar and Parmesan cheeses together and sprinkle it over the top, followed by the scallions. Cover with foil and bake for 45 minutes or so, until the potatoes are fork-soft. Remove foil and bake for 10 minutes more, so the top gets browned and bubbly. When you take it out of the oven, let it set for 10 minutes or so before serving. Note: there are a million different ways you could tweak this recipe to make it your own. It’s pretty much impossible to mess it up. Try new cheeses, add jalapenos, use shallots instead of onions, substitute crumbled bacon or chopped ham for scallions…do your thing. You’ve got this!